An April night several years ago, I took the overnight ferry from Athens to Crete in order to explore the Palace of Knossos, well-known as the heart of the ancient Minoan civilization. This is a trip I always wanted to take, and I was very happy I was finally able to do so. I stayed at Hotel Castro, a very nice hotel, very close to the town center, ideal to explore the archeological sites in Heraklion. The Palace of Knossos is only five kilometers southeast of Heraklion, the capital of Crete. I took a bus from the town center to get to the Palace, it took approximately 20 minutes. I chose to take a private tour that lasted about 2 hours (the cost was only $10) because as a detail-oriented person, I wanted to be informed as much as possible. A good alternative if you don’t want to take a private tour is the informative guide book that you can purchase in the entrance, which costs almost the same as the tour. The ticket costs only $3 and you can stay up to 3 hours to admire every little detail. 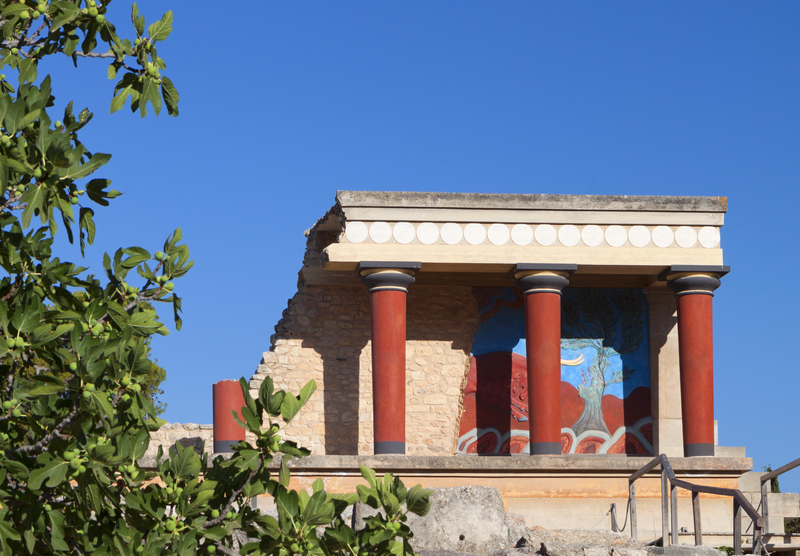 Also well-known as the Minoan Palace, Knossos is the largest Bronze Age archeological site on the island of Crete. Spanning six acres, it was built between 1700 and 1400 BC and boasts 1,300 rooms in an impressive labyrinthine layout. It was destroyed by fire in 1350 BC, and was never inhabited after that; however, the environs of the palace were beautifully transformed into a sacred grove of Goddess Rhea. In 1900, it was restored by Arthur Evans, with a technique called concrete. The palace is remarkably well preserved, with several buildings still intact. Various urns dot the vast complex, giving a feel of what life was all about those centuries ago. The walls are covered in beautiful murals and the famous bull horns, well-known as the symbol of Knossos, are apparent everywhere. Most of the exquisite photos that are exhibited are replicas, as the originals are kept in a museum. What impressed me the most was learning how the Palace was built, with 2 floors built underground and 3 floors built above ground, as well as the story about Athenians being forced to deliver seven youths and seven maidens to the Minotaur, as prey to his labyrinth, every 9 years. One year, Prince Theseus volunteered to be one of the seven youths, in an attempt to kill the Minotaur and end the senseless tragedy. He was successful and managed to escape from the labyrinth with the help of Ariadne, Minoa’s daughter. Unfortunately, he forgot to replace the ship’s black sails with the white ones that were the symbol of his success, and as a result, everyone thought he had failed. Seeing the black sails, King Aegean committed suicide by jumping into the sea that was later named after him. If you are looking for a chance to be educated during your Greece vacation, the Palace of Knossos in Crete is the perfect place. Most of Crete’s beaches have been awarded the European Blue Flag, which is given only to beaches that are found clean and fully equipped on a consistent basis. 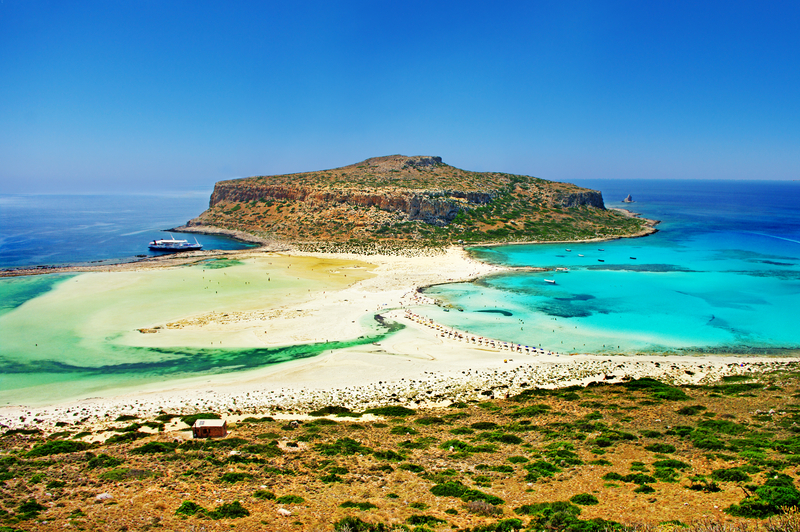 Crete also offers some of the best nightlife in Greece, Crete enjoys over 300 days of sunshine each year and classic Mediterranean weather prevails throughout the island. From March to October one can usually count on pleasant sun-filled days.